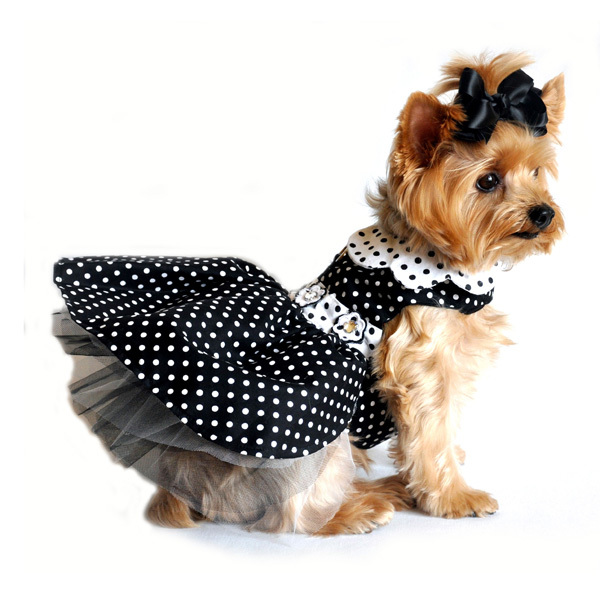 Your pup's fashion will be "spot on" with this darling Polka Dot Dog Harness Dress by Doggie Design in Black and White. 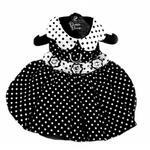 Make an impression with Doggie Design's Black and White Polka Dot Dog Harness Dress. This classic look is retro-inspired and perfect for parties any time of year. Features floral buttons with rhinestone centers at the waist. Tulle lining under the skirt makes a fuller and fashionable look. Comes with a reinforced D-Ring, matching polka dot leash, and heavy duty hook and loop closures. Made with Cotton/Poly Blend Fabric. Available in sizes Extra Small through Large. 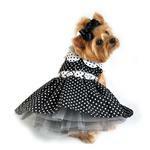 Polka Dot Dog Harness Dress by Doggie Design - Black and White Customer Photos - Send us your photo! My little Diva, 8 pounds wearing a small. She prances and knows she’s cute in her darling dress. We both love it. I have the medium for my 10.5lbs Markie. Roxy is 18” chest, 11” neck, 11” neck to tail. I love Doggie Design dresses the quality of them are amazing better then people clothes. This dress was on the higher side of price same with the watermelon dress but both of them did come with a matching leashes so it was ok. I’m so thankful that last month ( March 2019 ) pet of day then she won 2nd for the contest. Posted On 04/03/19 by Watkinsville from Watkinsville, GA Yes, Watkinsville recommends this product! This is the cutest things she has in her closet!! We purchased a small . . . but she has put on 2 lbs since I last ordered and we will have to exchange it for a medium!! Can't wait to get it back!! She thinks she's something in it . . . and it looks fabulous on her since she is a maltese and solid white!! These harness dresses are the bomb!! Posted On 04/01/19 by Cynthia from Terre Haute, IN Yes, Cynthia recommends this product! This black dress with white polka dots is adorable. My 20 lb Cavalier King Charles Spaniel wears a size Large, and it fit perfectly. The matching leash is great! I like the variety at BaxterBoo. I did find that a lot of things were out of stock, but happily I received a discount for waiting. Many places offer free shipping these days, and, of course, I would prefer that! Big surprise, but overall, a great website!